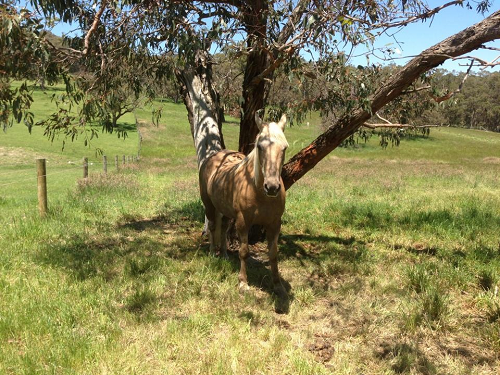 He has been a hardworking mustering horse all of his life, but now he lives in semi-retirement on a beautiful property in Tynong North here in Victoria. My friend was working in Mack's paddock. She suddenly realised the neighbour's bull had slipped into the paddock somehow and was charging straight towards her. Mack saw what was about to happen. He bolted towards the bull, coming between it and Ness. He headed it off away from her and chased it away! Ness had never seen Mack do anything else but quietly graze before.She said he had saved her life! Mack is the most gentle horse I have ever known. I was so proud of him. My life is so, so blessed by my awesome friends."